Hydrangea No-Show 2014 – Why Aren’t My Hydrangeas Blooming? After a very long and VERY cold winter, the traditional Mophead Hydrangea is a truly cherished and anticipated symbol of summer in New England gardens. 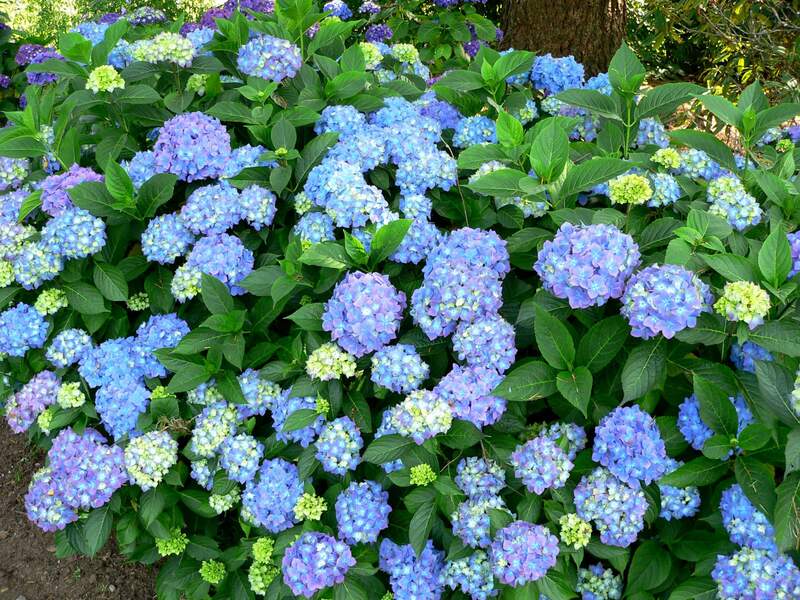 In many of our Fine Gardening client’s gardens this season our crew has encountered Hydrangea macrophylla or the Mophead Hydrangea without blooms. Throughout the spring, we were grimly greeted with a mass of dead stems with no signs of leaves and no flower buds. Eventually new growth emerged from the base of the plant surrounding the dead stems. This particular variety of Hydrangea are ones that bloom on “old wood” only (meaning last season’s stems). When in past seasons you could easily lose count of the number of blossoms, this season we saw some plants with only one lonely bloom! We cut the dead stems out but, although the plant looked green and lush, the main reason we plant and love these Hydrangeas was sadly lacking. The cause of this was a spring freeze that killed the developing bloom buds and all the emerging leaves as well. As a result, most of the new growth for this season came from the roots. Since the flower buds develop on the old stems, once these stems are killed in a freeze new flowers will not appear until the following year and only then if it is a milder spring. The good news is that there are many exceptional Hydrangeas that will bloom despite this kind of damage. ‘Annabelle’ Hydrangea arborescens, Hydrangea paniculata or Pee Gee Hydrangea, Hydrangea quercifolia or Oakleaf Hydrangea are usually reliable seasonal blooming options. Weather cooperating, our beloved Mophead Hydrangeas will be back in full glory next year! This entry was posted in Growth habits, Pruning and tagged Flowering shrubs, Growth habits, Hydrangea arborescens, Hydrangea macrophylla, Hydrangea paniculata, Hydrangea quercifolia, Landscape maintenance, Mophead Hydrangea, Oakleaf Hydrangea, Pee Gee Hydrangea, Shrubs on August 7, 2014 by Christie Dustman. Do you wish your yard looked like some of your neighbors? Do you feel like they got the GARDEN HANDBOOK and you were absent that day? Well, take it from a long time gardener: getting the right plant for the right place isn’t so easy. There are so many factors to consider and impulsivity often rules. When you look at the PLANT TAG find the zone recommendation, which is usually a range, like 5 to 7. If your zone is included in this range, great. If not, your plant may succumb in winter since it can’t typically withstand such cold temperatures. As you might imagine, there are gardeners that push the Zone limits and are happily rewarded with a live plant or sad with a dead plant. Keep in mind that optimal conditions will produce the best results. For example, a plant that is labeled Sun to Part Shade may survive in a lot of shade but it may not flower as robustly as if it were in a sunnier spot. Or it may disappear one winter and never return. ULTIMATE SIZE A common mistake people make is not fully appreciating the ultimate mature size of plants. This is more likely to happen when you are buying that cute little plant that is small because it is young. By checking the plant tag for Spacing recommendations as well as Size, you will have a better sense if that beautiful Ginkgo biloba (which can reach a height of 50 to 75 feet high) will fit in your small side yard. Great gardens take planning – page 1 of the GARDEN HANDBOOK! We are always here to help too. 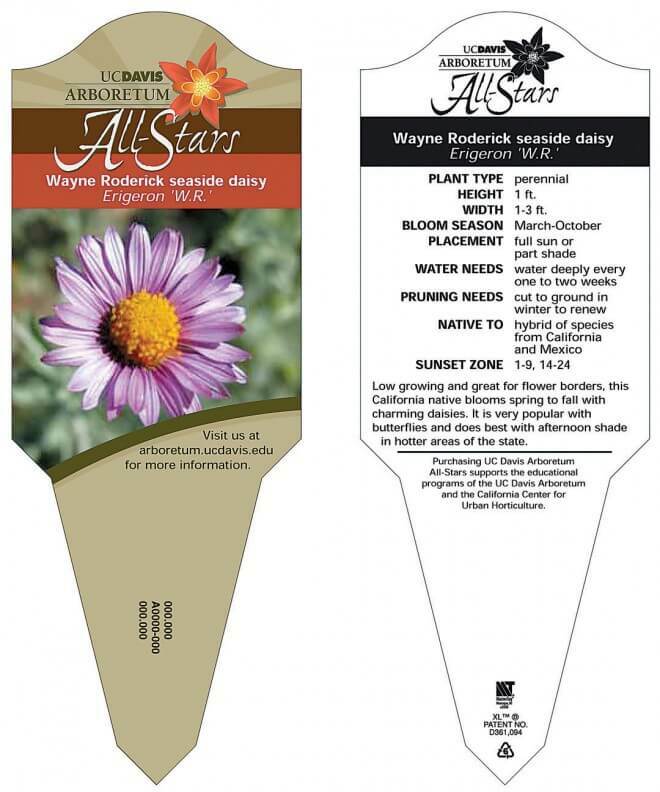 This entry was posted in Design, Garden Design, Growth habits and tagged Growth habits, Hardiness zone, Plant choice, Plant requirements, Plant tags, Sun/shade exposure on July 10, 2014 by Christie Dustman. Help…when do I prune spring flowering shrubs and trees? The show is over…spring blooming shrubs and trees have put on their much appreciated display. With blossoms just passing by, your plant is already planning for spring 2015. It is hard for us humans to remember that this is the right time to prune those same plants. Timing your pruning correctly will positively manage the shape and health of the plant as well as promote their bloom performance in the years to come. As a general rule of thumb: don’t prune spring blooming shrubs and trees more than a month or so after they finish blooming unless you are willing to sacrifice some bloom. Plants like Forsythia will now start developing their 2015 flower buds so waiting too long to prune will eliminate some of next year’s display. Spring bloomers like Forsythia and Lilacs renew themselves by sending up new stems at or near ground level each year. As plants age, older stems begin to crowd each other and the plant will flower less than desired. Cutting away some old stems will make room for new vigorous ones to take their place and gives the new shoots time to grow and bud up this year for flowers next year. Making selective pruning cuts to older stems promotes the overall good health and vigor of the plant. This is also a good pruning approach for Red Twig Dogwood and other multiple stem shrubs like Spirea. Do this type of thinning now. For more bushy shrubs with side branches off of a main trunk, like Azaleas, Rhododendrons, Pieris, and Kalmias, they can use some shaping after they bloom too. Consider their current shape and make some cuts inside the plant to increase air circulation and sunlight penetration. All too often, these shrubby plants get too dense and the flowering decreases. Shrubs that have been pruned incorrectly in the past or outgrow their location may require more radical considerations. 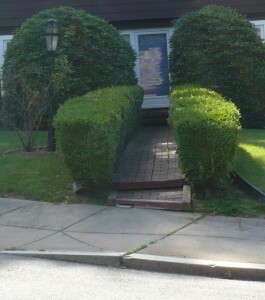 This is often called rejuvenation or renovation pruning. Some mature or neglected shrubs may need several seasons of renovation pruning to bring them back into scale with the landscape and restore their full beauty. To do any of this pruning, sometimes you need courage, sometimes you need coaching and sometimes you need a professional to take charge. We’re available if you need help. This entry was posted in Growth habits, Landscape maintenance, Pruning and tagged Azaleas, Flowering shrubs, Flowering trees, Forsythia, Growth habits, Kalmia, Landscape maintenance, Lilacs, Pieris, Red-twig dogwood, Rhododendrons, Shrubs, Spirea, Spring, Trees on May 15, 2014 by Christie Dustman. Gum drops, meatballs and blobs: believe it or not, these are typical shrub shapes commonly found in many suburban neighborhoods. Well-intentioned homeowners and professionals alike regularly shear off each year’s new growth, forcing bushes into visions of symmetrical greenery never found in nature. And then we all wonder – why do my shrubs just keep getting bigger and flower less? To answer this conundrum, we must learn a little about plants and their growth patterns. When we cut a stem of a plant, it sends a signal to the plant to grow MORE shoots further down on the branch and produce two “bunny ear” shoots at the cut tip. So one cut ultimately encourages a burst of even more growth. This starts a maddening cycle of shearing, profusion of growth, more shearing and more growth. Soon your forsythia only has a few yellow blossoms on the outside of the shrub and your front hedge look like a chaotic pile of twigs all winter long. The indiscriminate cutting of all branches, or shearing, has an unanticipated effect: more vigorous and uncontrolled growth. And we compound the problem by inadvertently shearing off flower buds, removing the aesthetic beauty, fragrance and natural form of the plant. Pruning, by contrast, is the process of strategically cutting select branches to meet the plant’s short-term and long-term health and aesthetic goals. Pruning takes into consideration maintaining optimal plant health, controlling growth, encouraging flowering and fruit production, and ensuring property safety. Suffice it to say, electric hedge trimmers can’t be used exclusively for a more thoughtful approach to plant pruning. Aesthetic pruning considers all of these factors, then adds the goal of maximizing the plant’s beautiful shape given its type and function in the landscape, and how it relates to surrounding plants. 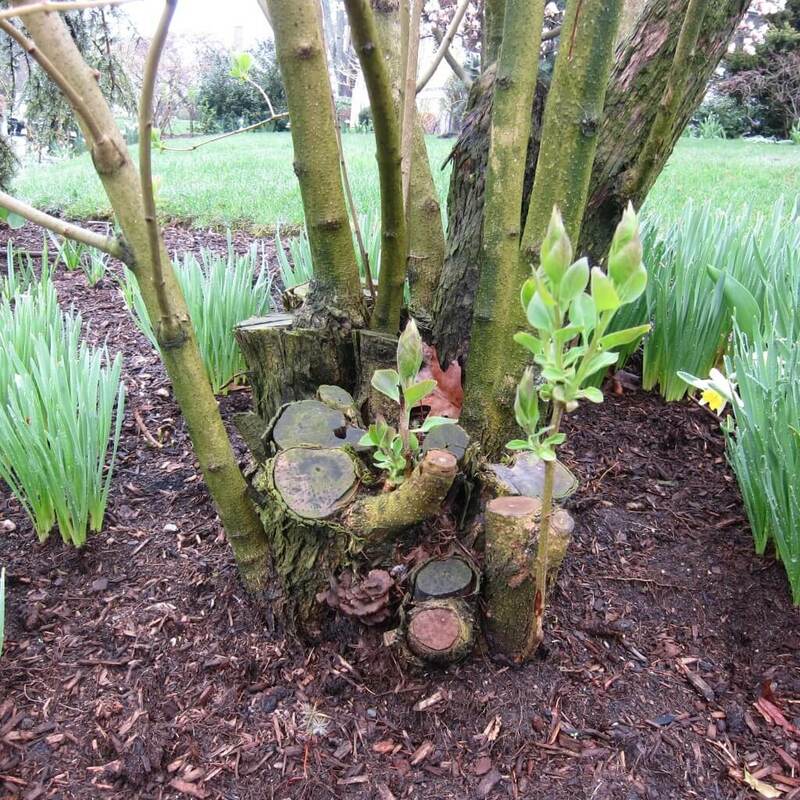 Aesthetic pruning brings in an artistic element to the landscape and the shaping of plants. Time of the year: What is the optimal time of year to prune your plants and shrubs? Plant location: Should it be trimmed back from the window or the front walkway, or allowed to develop a lovely fountain-like shape in the lawn area? Should the plant be moved to a more suitable location? Age of the plant: Is this an older plant with inner stems that should be removed to encourage new growth and more abundant flowering? Is this a young plant that requires a stronger root system and more density in its branches? Type of tool: Should I use hand pruners to make a few more significant cuts to the plant that will meet my goals? Will a hedge trimmer start that maddening growth process? Defining your goals for any plant pruning will lead to the best results and minimize unintended consequence. Late winter and early spring is prime pruning season, especially for spring flowering shrubs and plant which need to be pruned after they flower. 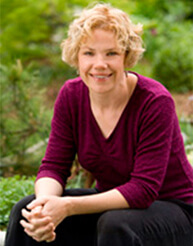 If your goal is a beautiful and healthy home landscape, the benefits of aesthetic pruning may be right for your garden. Pruning with a vision for your entire landscape scene will increase the enjoyment of your garden plants today and for many years to come. This entry was posted in Design, Growth habits, Landscape maintenance, Pruning and tagged Growth habits, Landscape maintenance, Shrubs on April 24, 2014 by Christie Dustman. Ok, so I do have a love affair with upright and uptight plants. In smaller gardens, air space needs some volume – so let’s go up. Let’s compare three similar plants today that grow tall and skinny. This entry was posted in Design, Growth habits and tagged Buxus 'Graham Blandy', Growth habits, Ilex crenata 'Sky Pencil', Shrubs, Thuja occidentalis 'DeGroot's Spire' on June 10, 2010 by Christie Dustman. 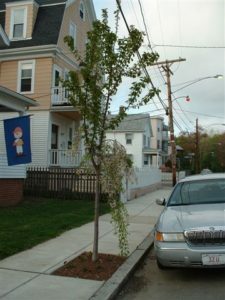 This entry was posted in Design and tagged Amelanchier trees, Growth habits, Trees on April 30, 2010 by Christie Dustman. This entry was posted in Growth habits and tagged Growth habits, Trees, Weeping cherry on April 21, 2010 by Christie Dustman. Okay now, what happened here? Talk about two different growth habits! If you know what happened here, post a comment on this blog. Hint – this is a weeping Cherry planted as a street tree. I will answer in a couple of days if no one gets it! This entry was posted in Growth habits and tagged Growth habits, Trees, Weeping cherry on April 14, 2010 by Christie Dustman.